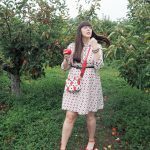 By now you’ll all know that I fall in love with every Disney x Cath Kidston collection, there has been Mickey and Minnie, 101 Dalmatians, Tinker Bell, and now the fairest of them all, Snow White, and it is totally adorable and perfect for autumn, especially the new apple and spot print that you can see on my dress and bag. 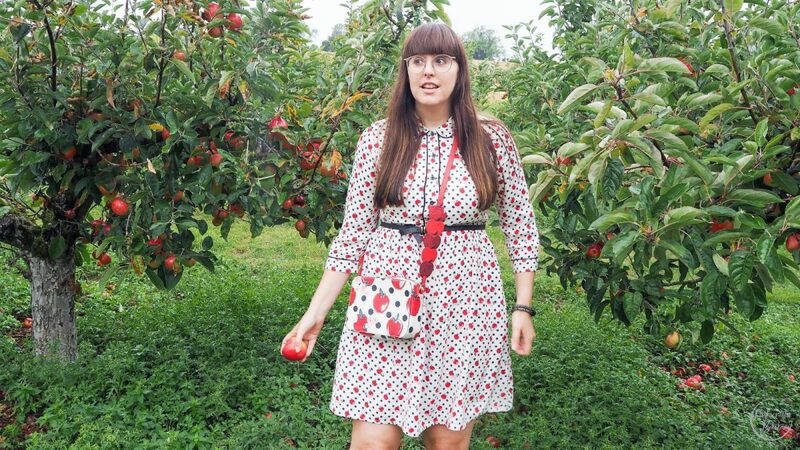 Like seriously, how cool is this cute look, so good that I literally want to take a bite out of the apple print!!! See what I did there!!! So of course after receiving these gorgeous pieces I had to drag my husband an hour in the car, in the rain, to a farm where you can pick your own apples. It was hilarious, the rain was coming down hard, everyone else around us was wearing sensible clothes and shoes, and there I’m dressed up like an apple, and you know what I wouldn’t have it any other way. I’m not the easiest person to please when shooting, I generally hate all pictures of myself, but these were literally taken in less than 5 minutes, as we didn’t just have to contend with the rain, but also the fact that the farm, even though it said on its website it was open all day was shutting in 5 minutes. 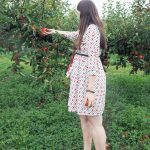 After an hour-long drive I wasn’t going to miss out – so we quickly snapped, quickly picked and ran off back to the car with a basket full of delicious apples and some cool pictures for the blog. 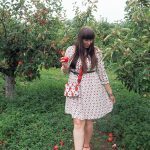 There’s something about a Cath Kidston print that just makes me happy, and the button spot is one of my favourites and I’ve loved how they’ve revamped it for every Disney collaboration. 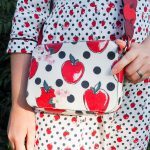 My favourite piece has to be the cross body bag, I love a good bag, and this one is similar to my Mickey Mouse camera bag, and not only is the print adorable, I love the apple detailing on the strap – such a nice touch and a great price at £60. There are also some cute red glittery apple accessories including a wristlet bag and a coin purse, and I can’t think I need them both, fingers crossed my husband doesn’t read this blog, as I know what he will say, I definitely don’t need them, but I want them. 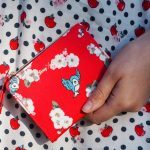 As well as the button spot, Snow White makes a cameo in Cath Kidston’s signature Wellesley Blossom print to create the ‘Scattered Blossom’ which sees Snow White, apple in hand, amongst the wild flowers and birds. It is so beautiful and it features across fashion, sleepwear, accessories and homeware. 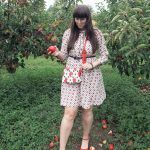 My top pick has to be the Scattered Blossom Denim Skirt, which I also have to style up, as well as the Snow White Sweatshirt, which would look good worn together. For a full look at my favourite Snow White pieces scroll to the bottom, but be warned it is very cute and magical you might want it all. Are you a fan of the Disney x Cath Kidston collaborations?